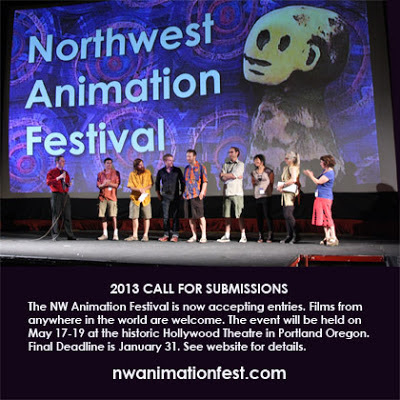 This year the Northwest Animation Festival will become the largest animation show west of the Mississippi. Organizers plan to screen nearly 150 short films on May 17-19 at the historic Hollywood Theatre in Portland, Oregon. The entire program will then repeat on May 31 – June 2 at the Bijou Art Cinemas in Eugene, Oregon. Audience favorites screen at a "Best of the Fest" event this fall. Submitting your film is remarkably easy. Send the 20-question entry form via email, and a copy of the film via online transfer (WeTransfer, Vimeo, Dropbox, FTP). Standard entries are $30, student entries are $15. Enter soon! The final deadline is next Thursday, January 31.